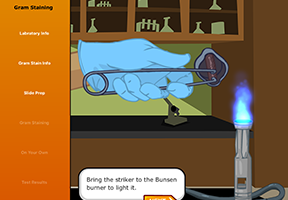 Scientists in the laboratory take great care to maintain a sterile environment, making sure that contamination doesn’t enter the experiment from workers' hands or other objects. Students will practice using special disposable equipment to perfect their lab skills while testing milk samples of pasteurized and raw milk for harmful bacteria. Students will inoculate petri film with samples and then incubate the bacteria. Finally, they'll count the resulting bacteria colonies and draw conclusions from what they see. 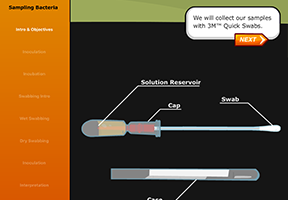 In the second half of the interactive, students will investigate the origin of the bacteria by swabbing surfaces at the dairy to see if they are contaminated. Learn how to use Gram staining to differentiate beneficial bacteria from dangerous bacteria in food samples. 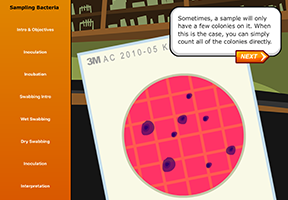 Working in the virtual lab of a dairy processing plant, you analyze yogurt samples and follow step-by-step lab procedures to test for Salmonella and E. coli. 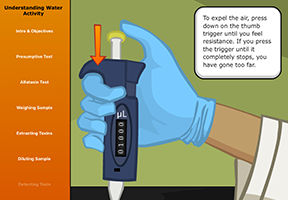 Sterilize your inoculation loop, and prepare your slide, then view the sample under a microscope and observe the differences in appearance between beneficial bacteria and harmful bacteria. 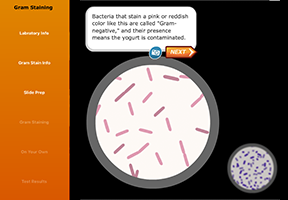 The interactive initially guides the user through each step of the lab process; then users prepare Gram stain slides on their own to find out for certain whether this batch of yogurt is safe. Lab technicians use microscopes for many tasks, including checking what kinds of microbes are present in a sample. 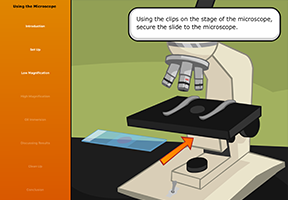 Using a microscope is one of the basic skills of laboratory work. 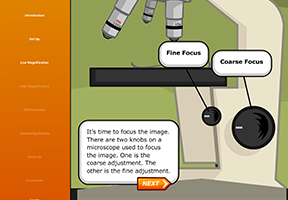 Learn how to choose the correct lens, adjust lighting and magnification, and prepare a slide for viewing. Using Gram staining and a microscope, you can differentiate beneficial bacteria from dangerous bacteria in food samples. 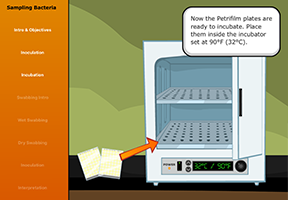 In this module, enter the virtual lab of a dairy processing plant to analyze yoghurt samples and test for Salmonella and E. coli. 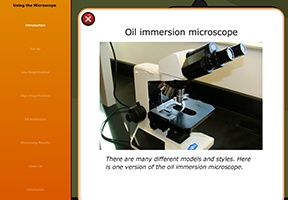 The interactive guides the user through theory and practice of using the microscope, so that they will have familiarity with the equipment and procedures when encountered in a real lab. Testing a substance's pH (how acidic or basic it is) provides a important piece of information for natural science investigations. 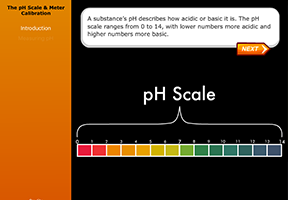 In food science, the pH of a substance – how acidic or basic it is – is key to how it functions in food recipes. 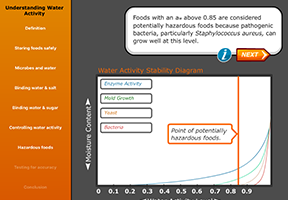 This module introduces learners to the pH scale and its uses in food science. They learn how to use the pH meter, and calibrate it by measuring solutions of standard value. 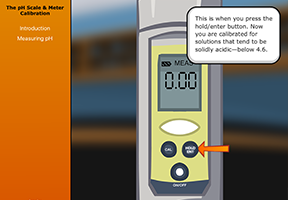 Virtual Labs: pH Scale & Meter Calibration familiarizes the user with food science lab equipment and teaches standard techniques for this specific procedure. 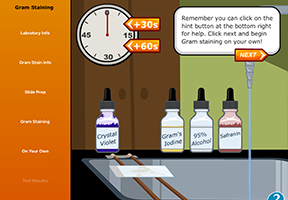 The interactive guides the user through theory and practice of using the pH scale and pH measurement, so they will have familiarity with the equipment and procedures when encountered in a real lab. Adding acidic ingredients is an important way to protect foods from dangerous toxins produced by organisms like C. botulinum, a microbe that is common and harmless in the environment but deadly when sealed with food in a jar. In the lab, testing the pH of a substance (how acidic or basic it is) provides important information for ensuring food safety. 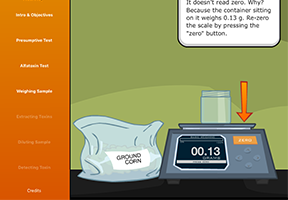 This module introduces users to proper sampling techniques when testing pH and explains how adjusting a food’s acidity can keep it safe from C. bot. 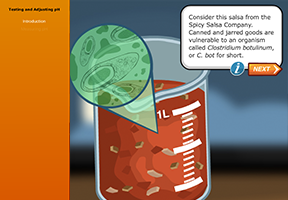 Virtual Labs: Acidifying Salsa familiarizes the user with food science lab equipment and teaches standard techniques for sampling. 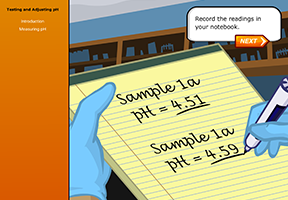 The interactive covers theory and practice of adjusting pH, so learners will have familiarity with concepts and procedures when encountered in a real lab. 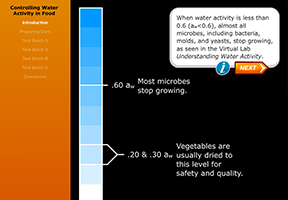 Moist foods – like fresh fruit or raw meat – often have high water activity and spoil quickly. But some foods that seem moist – like jam or pepperoni – don’t spoil as quickly. Why is this? 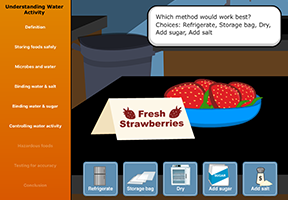 Virtual Labs: Understanding Water Activity familiarizes the user with food science lab equipment and standard techniques for measuring water activity. 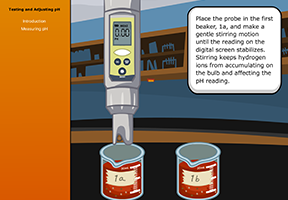 The interactive guides users through both theory and practice, preparing them for experiences in a real lab. 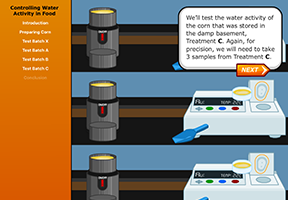 Complete this lab first, then follow up with Virtual Labs: Controlling Water Activity. 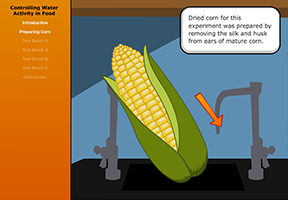 Virtual Labs: Controlling Water Activity in Food explores a traditional method of preserving corn by drying. 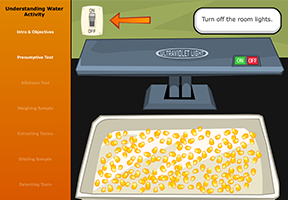 In this virtual laboratory, learners test water activity levels of dried corn and explore how they change under three different storage environments. 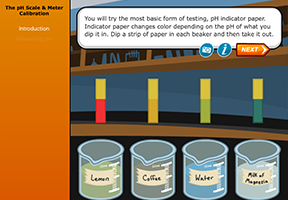 The interactive guides users through the theory and practice of sampling a food product, using a water activity meter, and setting up replicates, to build familiarity with concepts and procedures used in real food science labs. 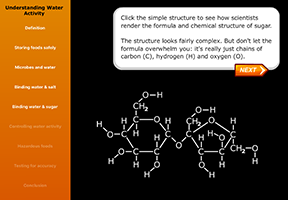 Before beginning this lab, it may be useful to complete Virtual Labs: Understanding Water Activity.